Graphite is a littermate to Cobalt that came through our program earlier this year. His trainers say he is just like his brother, very nice, friendly and sweet. He raced 51 races. Most of his races were at the Sanford Orlando Race Track but he also raced for a little while at the Sarasota Race Track. He turned 2 on May 21st. Sire is Fuzzys Cannon, Dam is Greys Redington. Graphite is a tiny boy that is smaller than most of our girls and weighed in at 63lbs at his last vet appointment. Graphite was a little interested in the cats he met at the vet clinic but corrected easily so may be trainable. He's happy, playful, and curious about everything around him in an adorable "puppy" way, but he's not hyper or destructive. He potties well on leash and is quiet in his kennel so may be the perfect dog for apartment living. He was sweet to both greyhounds in his first foster home and never had a single potty accident there. He travels well and likes to go. He can be just a little shy at first when meeting strangers, preferring to approach quietly and gently until he gets to know you but is the type that will warm up fast and be your best friend. 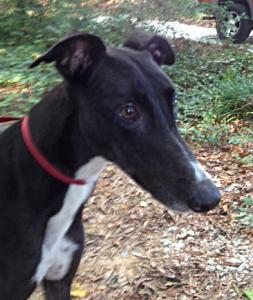 Graphite is a sweet little baby of a greyhound who's ready to meet the perfect family.